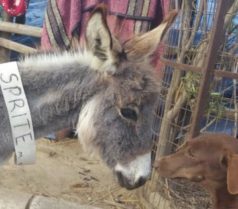 The Asswin Project for Donkeys and Other Animals in India is a UK registered charity which ﬁnances a healthcare programme for needy animals in and around the outskirts of New Delhi. 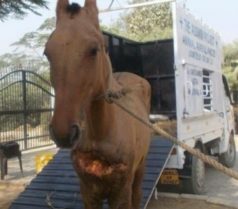 It rescues and provides medical treatment to injured and sick working donkeys and horses as well as street dogs and other animals in need. The team in India, headed by Jean and Bob Harrison and ably assisted by Kailash Kumar, work year round every day of every week and regularly visit the many construction sites, brick kilns, and so-called ‘slumdog’ encampments around New Delhi. 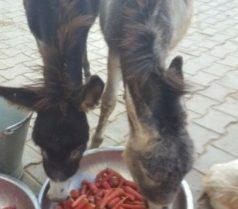 During these visits they give treatment and care to suﬀering donkeys, and at the same time oﬀer practical help and advice to donkey owners and their families on eﬀective animal husbandry. They also respond to calls from the community, the police, and the ﬁre service to help animals involved in road accidents, and have access to a veterinary service when needed. Jean, Bob and Kailash are supported by 8 workers who work in all the varying jobs required of an animal shelter; it is not just about the treatment and care for the animals but also the manual labour that is needed to keep the Shelter clean and in full running order with water and lights. They also maintain the vehicles as well as treat the animals wounds. Working at an animal shelter makes for long days in order to maintain the high standards required but there are many times when the animals show you their love and appreciation. Each day Jean, Bob or one of the lads picks up all the greens, carrots, bran and apples as treats when available. The lads distribute the feed in equal portions to all the equines and it is a joy to see their excitement. It is also a requirement of all those who work and/or volunteer at the Shelter to give as much TLC, by way of strokes and cuddles to all animals requesting it! Your kind donation of £5.00 can provide a recovering donkey with a daily treat of carrots for a whole week. 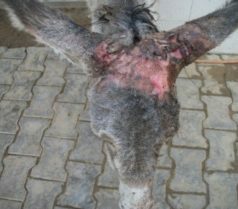 Your kind donation £10.00 can pay for the medical treatment of a donkey in need of care for up to 7 days. Your kind donation of £15.00 is enough to cover the costs of the rescuing and treating the next animal in need of care admitted to the shelter. The Asswin Project has joined up with easyfundraising.org.uk. This means Just by doing your normal online shopping you can help The Asswin Project.